Curtain rising!! 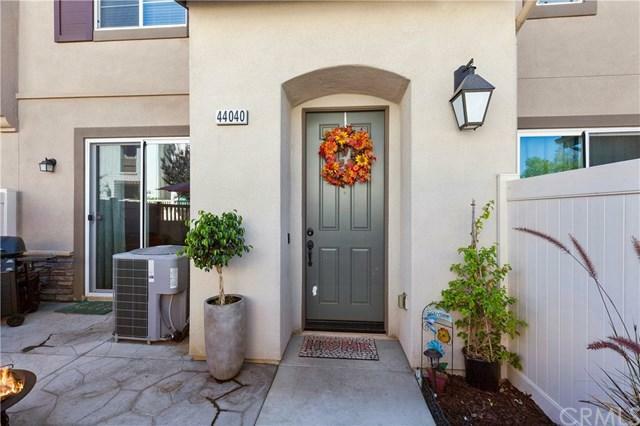 Highly sought after "Alegre & Aldea at Paseo del Sol" town home in South Temecula! Experience the joy of owning your own home in this 3 Bedroom/2.5 Bath, 1,319 sq ft living space. Beautiful Kitchen features Granite Counter Tops, Whirlpool Appliance Package in Stainless Steel Range/Oven, Dishwasher, Microwave/Hood Combo, Side by Side Refrigerator, White Hamilton Cabinets with Brushed Nickle Knobs, Bar Seating, Breakfast Nook, Decorator Lighting. Opens to your Living Room, both with gorgeous "Driftwood" Laminate flooring. Come home to comfort and relax in the large living area and extra large patio. Upstairs are 3 nice size Bedrooms, Full Guest Bath with Dual Sinks and Stackable Maytag Maxima XL Front Load Steam Washer/Dryer Closet off the Hallway. A Very Spacious Master Bedroom, Walk-In Closet and Master Bath featuring Portofino Counter Top and Dual Sinks. This home, also featuring A/C, ceiling fans, beautiful carpeting, and so much more! Pet friendly, Low HOA fees, Community Pool, Kiddie Pool, Spa, BBQ area, Playground, this complex has everything you need and want. "Alegre & Aldea at Paseo del Sol" is located near I 15, Old Town Temecula, wineries, golf courses, shopping, restaurants, entertainment and Paloma Del Sol Park, a City Park with ball fields and BBQ grills, is right next door!...Please be sure to view our videos for more views of this beautiful home. Sold by Romeo Parel of Parel Real Estate.